I met Chyna's owner Michelle at the Sherborne Castle Country Fair, well actually I have to admit when Michelle came back to order a Portrait I was off enjoying some of the yummy local food but thankfully my partner Darren was there to take over for me! 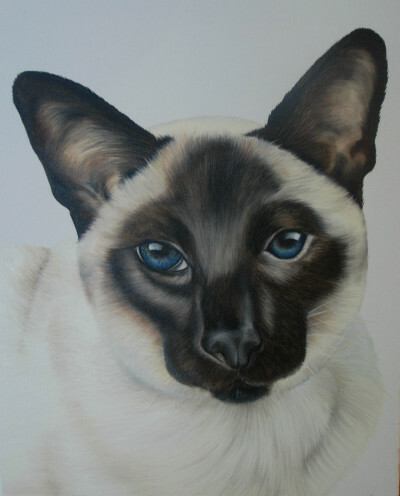 Michelle then sent over some photos and I couldn't wait to get started, as you can see on my website most of my portraits seem to be dogs so it was a lovely change and also something quite new as I had never painted this breed before. What strikes me most about Chyna is her beautiful eyes, unfortunately it was difficult for Michelle to capture the true colour of her eyes in a photo so I sent pictures of the painting throughout the process to Michelle so she could guide me on the colour to make sure it was perfect. I always find the eyes are the key to the painting, once you get that bit right the rest just comes alive.